BRITAINS is a leading manufacturer in die-cast models and is a name synonymous with quality models since William Britain started making toy soldiers in 1893 using the hollow casting process. Born on 8th August 1831, William Britain worked as a brass tap maker. He soon, with his family, started making mechanical toys in their own home. In 1893, their toy soldier manufacturing started with the hollow casting process for lead that William had developed and patented. This process gave them a light model with considerable strength along with large savings in the amount of lead used. Most importantly, it gave them the confidence in the quality and the ability to provide a steady production, giving the competitive edge they had been looking for. They had to decide how big their toy figures should be and agreed that they would make all their soldiers to a standard height of 54mm (2.125 inches), a scale of 10mm to 1ft, or 1:32 scale. This is the scale that is still used to day for the Britains Farm and adopted by all other manufacturers of Farm Toys and Equipment. During the 1914 - 1918 World War, sales of all military toys dropped to an all-time low. Food was short and Home Farming was important to feed the nation. Britains needed to do something to replace those sales. In 1921, the now world renowned Britains Model Home Farm was launched, in readiness for Christmas, consisting of 30 farm figures and animals which were introduced along with the first farm vehicle, the ‘4F’ Tumbrel Cart. Over the next few years new items were added to the range, which covered every aspect of farm life - animals in a range of positions and various characters of different ages. 1924 saw Britains make its first promotional toy – the Nestlé World Cow. Although tractors were available in one form or another since the turn of the century, they weren’t a common site in the countryside until their increased use during and after WWII when working horse numbers were drastically reduced. The first tractor introduced by Britains was the 127F/128F Fordson Major. 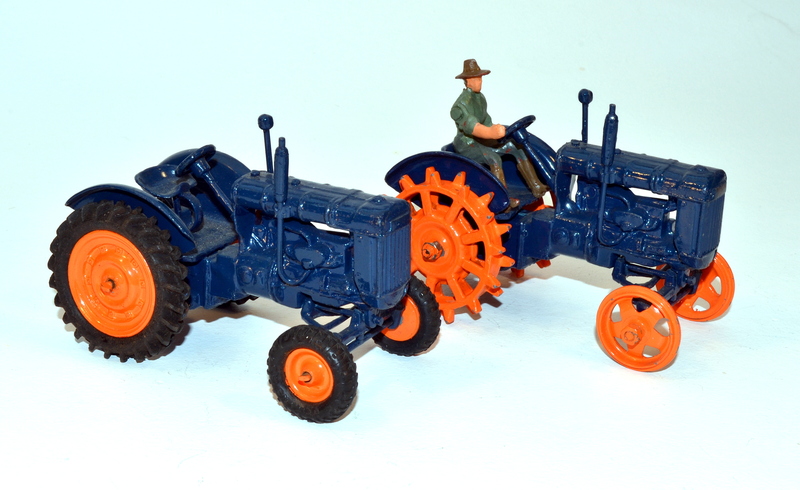 It was launched in 1948, just three years after the real tractor. It came with a choice of either metal wheels or rubber tyres, again following the trend in the countryside where tractors were playing an increasingly larger part in the day to day management of nearly every farm, within 20 years tractors became the chief mainstay of Britains business. The Fordson Major stayed in production in that format until 1958. In 1955, Britains bought a controlling interest in Herald Industries Ltd, the large manufacturer of top quality toy plastic soldiers and figures. This gave Britains access to the specialised plastic moulding processes and 1955 saw 23 figures and animals being introduced in this medium. These included a pipe-smoking farmer of the day, introduced as H2050 Farmer, carrying a shotgun. A very important change was made in 1959 with the arrival of 171F/172F Fordson New Major with metal wheels or rubber tyres. Marketed and boxed as the Power Major they were the first models to be produced using the zinc alloy die-casting technique. As on the full size tractor, Britains added a lifting rear hitch. This hitch proved so successful that it has been universally adopted by all other model tractor manufacturers. In 1968, Britains moved to Blackhorse Lane, Walthamstow where all departments, Administration, Design, Mouldmaking, Production and Packaging were importantly all on the same site. Also in 1968, 9529 Massey Ferguson 135 became the first non-Ford tractor in the range and in 1970; Britains introduced 9580 JCB Excavator, combining their diecast and plastic moulding processes. Since the 1970s many new models have been introduced following the trends of full size tractors. 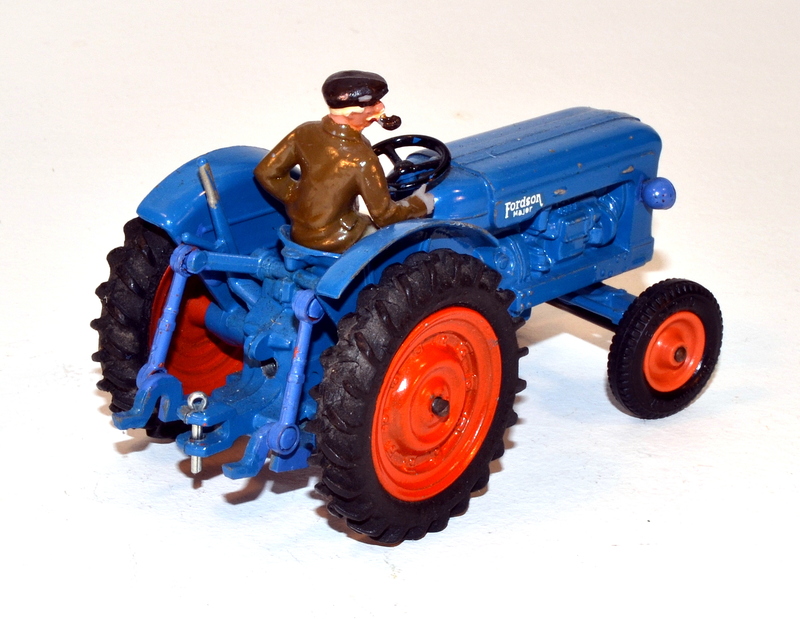 The 4711 Model Farmyard introduced in 1970 was one of the bestselling items of the whole Britains Farm. 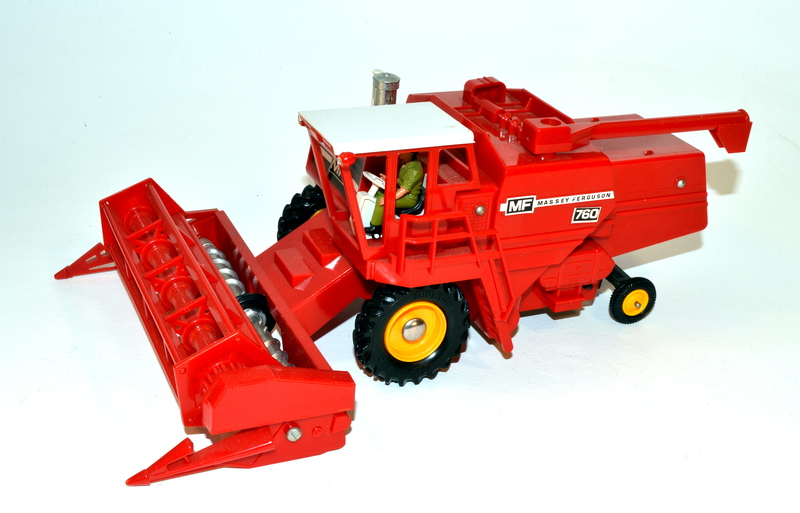 In 1976 the Herald range of farm figures and animals was fully absorbed into the Britains Farm and in 1978, the 9570 Massey Ferguson 760 Combine received ‘Toy of the Year’ Award at the London Toy Fair. In the 1980s more than 120 new models were produced for the Britains Farm, which in 1989 became known as ‘Authentic Farm Models’. In 1984, with over 90 years of toy production, and with no one in Britain family wishing to take their company forward, they decided to sell up. It was bought by Dobson Park Industries Ltd a company with a wide portfolio who in 1986 changed the name to Britains Petite Ltd. In 1991, the decision was made to close all work at Walthamstow and in January 1992 work was transferred to the Petite Factory in Nottingham. Sadly much of the development skills and personalities did not transfer. Britain’s celebrated its centenary in 1993 with a limited edition of 9527 Ford 5610 Tractor with Centenary colouring and logos. New also was the ‘Rosette Range’ of farm animals with new mouldings for the horses pigs and sheep, the first time they had been updated since 1955. In 1997 Britains was bought by ERTL, one of the largest toy manufacturers in the world. Importantly Britains were now able to access the global licenses to produce models from John Deere and Case IH, which have since gone on to be one of the best-selling ranges. All production was transferred to China at this time. In 1999 ERTL was bought by Racing Champions International Ltd whose business was making die cast models from the American Nascar series, The 2000 Trade Catalogue appeared with logo of Racing Champions and the addition of a 1:64 scale Junior Farm. In 2001, new products from JCB, Land Rover appeared with a special RSPCA range, an enlarged Elite Range and Britains Country Farm Building Sets. Britains have always worked very closely with the original equipment manufacturers (OEM’s) which is the secret of the incredible amount of detail in the models. These days Britains have access to the very detailed, very complex computer CAD files and use stripped down versions of those to generate the prototypes and get the detail. For the older tractors things are not so easy. There may be draughtsmen’s drawings of the tractors but these are very difficult to get hold of so rulers, tape measures, detailed photographs and a lot of love and dedication go into producing our Heritage range. 2007 was the first of the ‘Vintage Tractors’ - 42196 Ford 5000 Tractor. In 2008, a new range, the 1:16 Britains Big Farm was introduced with 3 tractors and 2 trailers. The ‘Big Farm’ range was extended in 2009 and radio control function added to one tractor. Also, for the first time radio control came to the 1:32 Farm with 42480 Radio Controlled John Deere 7930 Tractor. In 2010, Learning Curve UK, as a subsidiary of RC2 (originally Racing Champions) took over all the Britains and ERTL Farm Models. Finally in 2011, TOMY took over the ownership, adding their expertise in making toys for children including a John Deere preschool range for budding farmers. Today, Britains is Europe’s oldest specialist in agricultural toys and collectibles and has established itself with high quality innovation in perfectly replicated diecast miniatures, whilst remaining true to its over 95 year heritage. Britains offers a full range of diecast farm models including tractors, implements, vehicles and accessories, allowing children aged 3+ to build their farm, as well as constantly refreshing and updating our collection for our enthusiasts. Britains is continuously supported through the ongoing farming press reviews we receive about new product releases, as well as model shows and agricultural events. We are very proud that in 2017, we can now offer our valued consumer our first catalogue-style website, supported by our popular Facebook page, where we have a growing number of Britains Farm Toy fans, keeping Britains relevant for generations to come. Thank you to Racing Champions, First Gear as well as our consultant, Warner Hall, for provided the history of the Britains brand.